Rohea is a Finnish tech company based in Helsinki. We make complex and demanding software simple, scalable and usable for everyday use. Rohea was founded by three M.Sc. students in 2007 as an operating company for Kotikokki.net, which is the biggest food and recipe site in Finland today. 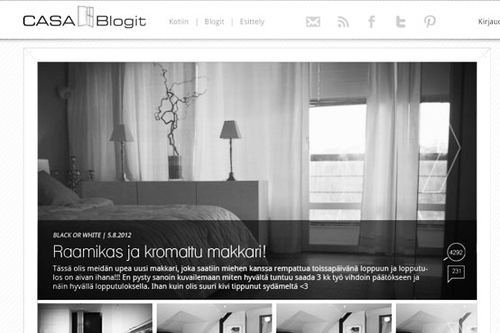 Kotikokki.net is co-owned by us and publicly listed Alma Media Oyj. In the past we've operated altogether five B2C web services, which served up to 2 million unique visitors every month (that's more than a third of Finland's population, month after month). We've also done internal startups and some joint-ventures to learn new interesting tech. We're a product-oriented company, and we have more than a decade of experience on building value-adding and human-centric services. Contrary to our B2C times, we have since switched our full attention to B2B services. Our aim is to bring our customers a product that can solve business needs smartly by leveraging common elements and unique solutions. Building demanding solutions, keeping the end-user in mind, and continuously investing in new technologies and learning, are core traits for us. This is what makes our products future-proof. If these sound great to you, come work with us! §1 Work as a team. Partner up. We are strong supporters of partnership and finding win-win solutions. We are not big fans of choosing "Me" before "We" or "Us" before "You". When the company succeeds, its employees and customers should as well. §2 QUALITY FIRST. SHIP IT. We understand we don’t have an infinite amount of time to ship, nevertheless we don't bargain on quality. More often than not good enough is not enough. We aim for elegant solutions that will last the test of time. If they don’t, we refactor. §3 DO AS YOU WANT. MIND THE OTHERS. We believe in freedom. We want to be quite free to decide our own way of doing things both at the company and at the individual level. That said, we understand our actions affect others who depend on us, and we can't let them down. §4 TAKE PRIDE. AIM HIGH. We take professional pride in our work, our company and our products. There is no "I just work here" or "it's not my responsibility". We aim high, work for it and will not be happy with second grade success. We believe in continuous learning, both professionally and personally. We devote time to prototyping and studying new ideas. We try to learn from our past mistakes and look for opportunities to improve our way of doing things. When things go well, we are quite happy to say it aloud. When challenges arise, we confront them head on and admit our faults if any. We give credit where credit is due and direct, honest feedback when things go south. Can we break this to smaller pieces? Yes. I coded that one as well.